Ivory Coast striker Didier Drogba has confirmed that he will leave the Chelsea this summer. The 34-year-old has spent eight years at Chelsea, scoring 157 goals in 341 appearances, and helped the Blues win 10 titles. Drogba, who scored the winning penalty in the Champions League Final victory over Bayern, is set to be a free agent when his Blues contract expires next month. 'It has been a very difficult decision for me to make and I am very proud of what we have achieved but the time is right for a new challenge for me. 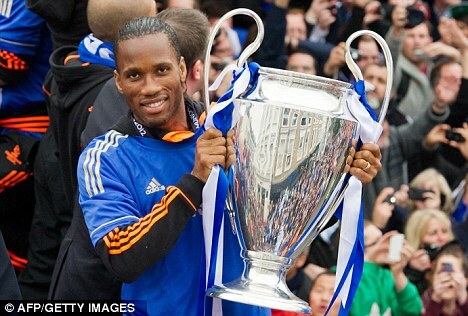 Drogba feels that the Champions League win was a fitting note for his departure. He added: "'As a team we have accomplished so much and have won every single trophy possible. "Saturday was a very special moment for everyone at the club and for all the fans. I am very proud to have played my part in bringing many trophies to this club, which has been my home for the last eight years. "I would like to take this opportunity to thank everyone at the club, especially Roman Abramovich and my team-mates." Drogba's contract stand-off dated back to last summer, with the club refusing to bow to his demands for a two-year extension. 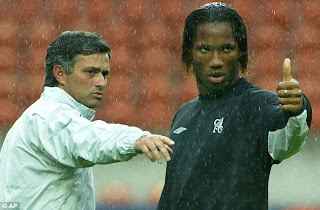 Drogba was one of Jose Mourinho's first signings as Chelsea manager and he has enjoyed a highly successful stint in London. As well as three Premier League titles, he has won four FA Cups and two League Cups before Saturday's Champions League triumph, scoring nine goals in finals. He is fourth on the list of Chelsea's all-time goal-scorers with 157 and is also the club's leading scorer in European competition with 34.